Home Fighting	This Bombshell Event May Paralyze France & Change our World This Weekend! This Bombshell Event May Paralyze France & Change our World This Weekend! You’ve simply got to see and share this video. This is HUGE!! Furious yellow vests are preparing to withdraw all their euros in a massive run on French banks, as the violent protests spill over to Britain. 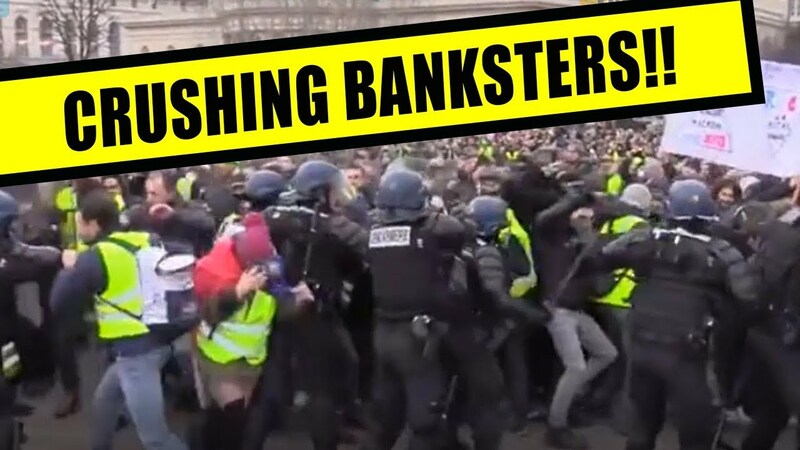 Yellow vest activists are urging French citizens to empty their bank accounts and spark a massive run on the country’s banks in their longstanding fight with the government — which could potentially lead to the collapse of its Rothchild’s banking system. And that would be something to see. The call for citizens to withdraw all their euros come as copycat protests are planned for Britain this weekend. The left-wing “People’s Assembly” activist group has invited thousands of people to wear yellow vests at an anti-austerity “Britain is broken” march in central London this weekend. Meanwhile right-wing, Brexit-supporting activists have signaled their intent to hold demonstrations in British cities, including the capital, under the banner “#YellowVestUK”. This comes ahead of the ninth straight weekend of protests across France, with yellow vests now issuing calls on social media for massive cash withdrawals from banks. Protesters hope the move will force the government to listen to their demands, notably their call for more direct democracy through the implementation of popular votes that allow citizens to propose new laws. Remember democracy, always hailed as some virtuous form of government (as if there could ever be such a thing) is a majority rule scenario…which works against, not for individual liberties. WHAT COULD A BANK RUN MEAN? If a bank run succeeds, the yellow vests could cause a complete failure of France’s banking system. Unlike Australia, France operates on a Fractional Reserve System meaning their banking system holds a fraction of money that’s deposited by customers. The rest is used to make loans, creating new money. A bank run is the situation that arises when a financial institution’s customers withdraw all of their deposits simultaneously or within short succession out of fear for the bank’s solvency, or the bank’s ability to meet its long-term fixed expenses. Essentially, it is the banking customer’s fear of losing their money and distrust in the sustainability of the bank’s business that leads to a mass withdrawal of assets. To gain a better understanding of what occurs during a bank run and its implications, people have to understand how banking institutions and customer deposits work. When you deposit funny money, known as bank notes, into a bank, you will generally make that deposit into a demand deposit account like a checking account. With a demand deposit account, you have the right to take your money out of the account on demand, that is, at any time. In a fractional-reserve banking system, though, the bank is not required to keep all of the money in demand deposit accounts stored as cash in a vault. In fact, most banking institutions only keep a small portion of their assets in cash at any time. Instead, they take that money and give it out in the form of loans or otherwise invest it in other interest-paying assets. While banks are required by law to have a minimum level of deposits on hand, known as a reserve requirement, those requirements are generally quite low as compared to their total deposits, generally in the range of 10%. So at any given time, a bank can only pay out a small fraction of the deposits of its customers on demand. By the way…there’s another term you could use for fractional-reserve banking. It’s called a ponzi scheme where there’s not enough available cash for all participants at any given time. The system of demand deposits works quite well unless a large number of people demand to take their money out of the bank at the same time and over the reserve. The risk of such an event is generally small, unless there’s a reason for banking customers to believe that money is no longer safe in the bank. Suffice it to say that Bank runs can be economically disastrous and serves to highlight the fact that the federal reserve banking cartel is operating on a foundation of unbridled unprincipled immorality. If banks were legitimate businesses holding all the assets of every customer at all times there wouldn’t be a problem. If everybody who deposited any amount today could ALL withdraw all their cash tomorrow without a problem you would have an honest business with honest practices. But, since Everyone can’t withdraw all their deposits at the same time without the bank declaring a “bank Holiday” and closing it’s doors, you have just revealed a dishonest business with dishonest practices. The countries banks are believed to have about a quarter of the cash needed to weather a bank run. If reports are true in saying 70 per cent of the population plans to withdraw all their euros, it means more than 46 million people will be directly revolting against the system. This could lead to a systemic banking crisis in the country where almost all the banking capital is wiped out. HOW COULD IT AFFECT ECONOMY? France has the seventh largest economy in the world and the second largest in Europe, valued at $US2.58 trillion, according to world bank data. It relies heavily on tourism and agriculture to sustain this — and boasts being the most visited country in the world. If a bank run leads to widespread financial crisis it can result in a long economic recession for businesses and consumers who don’t have enough money. During the Great Depression in the 1930s much of the economic damage was caused by bank runs. A bank run like the one being promoted in France now could potentially paralyze the country’s economy and lead to a collapse in the Euro. It’ll be interesting to see what happens in the coming weeks. Leave your thoughts about this possible bank run for the world, the google thought police and criminals in the Rothchild’s banking cartell in the comments section below. If you enjoy my content, subscribe to this main channel, my back up channel HighimpactVLOGS my back up to the back up channel HighImpactTV and my bitchute and gab channels. All these links will be in the description and in the pinned comment. I’ll see you guys in the next heavily censored, shadow banned video.